Julie Christie is doing something lots of people dream of. She’s making her living through her passion. What was once a hobby is now a successful business. But it’s more than a business. Tea Break Togs is a community of like minded photographers. Photographers who want to learn to take the best possible photographs. What started out as workshops and one-to-one tuition, has spawned into an online education platform. From free webinars, to paid-for course – Julie and her team are building something special. And podcasting has played a key role on the TeaBreakTog.com journey. Julie was already a fan of podcasting. She knew what it had to offer. The intimacy of having someone talk, just to her, sparked the idea to produce her own show. If she felt a deeper connection with the hosts of other shows, could her own show have the same effect? The more she thought about it, the more Julie became convinced that a podcast would help bring her closer to her audience. Establishing that level of relationship is what would help build trust. It would position her as an authority in the photography education field. So convinced was she, that she recorded an initial podcast episode. And she shared it with – nobody. She didn’t publish it. A combination of fear, self-doubt and the classic case of imposter syndrome stopped Julie in her tracks. Who was she to tell the World she was a photography teacher? Would friends and family think she was on the mother of all ego trips? She felt the same hangups that every would-be presenters faces. The fear was real, but she still knew, deep down, that podcasting was right for her. So instead of writing off podcasting, she’d just postpone it for a while. She’d get round to it eventually. She’d launch when it was perfect. She’d launch when ‘the time was right’. Julie was doing what we all do from time to time. She was procrastinating. She was making excuses to not hit publish. But that changed with one simple question. The follow-up question hammered home the point. That’s what changed everything. The fear of being ‘beaten to the punch’, was far greater than the fear of publishing. In a battle of fear – publishing won. Although the fear and doubt still remained, it was no longer all-consuming. But there was one thing still holding Julie back. Technology. The equipment, software and the challenge of publishing to iTunes caused a lot of confusion. Julie is technically capable and picks things up quickly, but the technology ‘nuts and bolts’ of podcasting doesn’t excite her as it does some. She just wanted to find the easiest way to publish her podcast. It mirrors her approach to Tea Break Togs. She appeals to people who aren’t technically minded. The kind of people that want a plain English approach to getting the most from their camera. If it’s technology focussed tuition, that is more about the kit than the photographs, then TeaBreakTog.com isn’t for you. Julie had two options. Embrace her inner geek, and do everything herself, or find someone to help. That’s when our relationship moved from being business colleagues and friends to being partners. We worked closely to identify what was holding Julie back. What were the things she enjoyed in the podcasting process? And what were the elements holding her back? We developed a process together that worked. Julie would record her show in her office and we’d do the rest. We’d get the raw recording and take on the role of podcast producer and editor. We’d top and tail with a professional intro and outro, we’d process and edit, and then, we’d publish to iTunes. It was a perfect partnership. Julie’s acknowledged that, without that initial support she would have never got out of the podcasting blocks. With the process established and working well, Julie still had self-doubt. After a few episodes the feedback was almost non-existent. And if they were listening – were the shows helping? That lack of immediate engagement fueled the fear. The silence reinforced all the feelings that were holding her back. We’d warned Julie that it can take time to find your audience. But, there’s no getting away from it, podcasting can still feel like a giant leap of faith. Slowly but surely the feedback started to come. Her listeners were engaged. Her listeners were passionate. Her listeners were learning. Julie was finding her tribe. It was validation. It was the confidence she needed to continue her adventures in podcasting. Despite the feedback, Julie admits that keeping going was tough at times. Was podcasting a bit of a luxury? Could she really afford the time to record her show? With other priorities competing for the business’ attention, maintaining the consistency was hard. Sticking with it worked, though. Engagement increased and relationships strengthened with her audience. The fear that Julie once felt has been replaced with confidence. Confidence that the business she’s building is helping people become better photographers. But she’s not just educating her tribe – she’s inspiring them. And what’s interesting, is that the tribe are inspiring each other. The Facebook group has almost 4,000 members and unlike many Facebook groups, the engagement levels are high. Members support each other. They offer advice. Many of those members started their Tea Break Togs journey as listeners to the Tea Break Tog podcast. That’s where the relationship started. That’s where the trust was built. That’s what tipped them over into joining. From listening to Julie’s voice. From hearing that she meant it. From knowing that she cared. This is the deep audio-fuelled engagement that caps the content stacking model. The deep relationships she now has with many of her students and community members wouldn’t have been possible without her podcast. Speaking to Julie, that’s what consistently comes across. 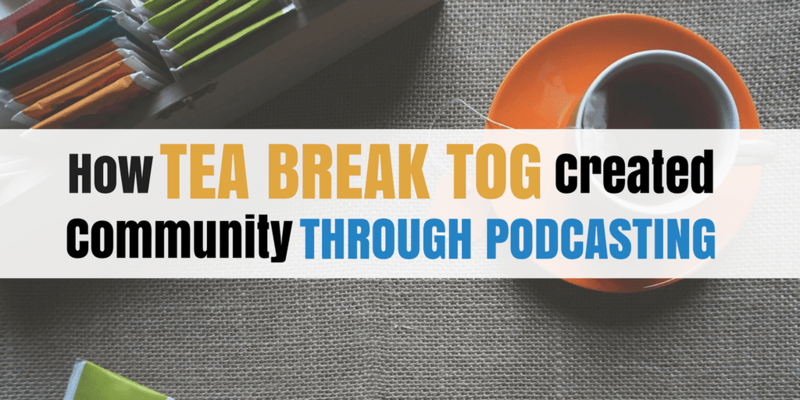 The blogs that were the early focus of the Tea Break Tog content marketing strategy didn’t give her the same level of connection. When it comes to engaging on a personal level, the written word can’t compete with the spoken word. You don’t get much more personal than being in someone’s ears as they go about their everyday life. The fact that they are choosing to listen speaks volumes. Those early, loyal listeners now trust Julie and Tea Break Tog. And when Julie launched her first course, who do you think were among the first to put their hands in their pockets? Who were the people that shared and promoted the course? Her loyal listeners. Julie’s Tea Break Tog Tribe. The commercial foundation of the business is built on that core audience, many of which built that trust through her podcast. And for that, Julie will always be thankful.